Final Reflections. What is your Kigali2Joburg? So the Kigali2Joburg is complete and tonight, we find ourselves spilt up in different hotels in Johannesburg or flying home to Canada. 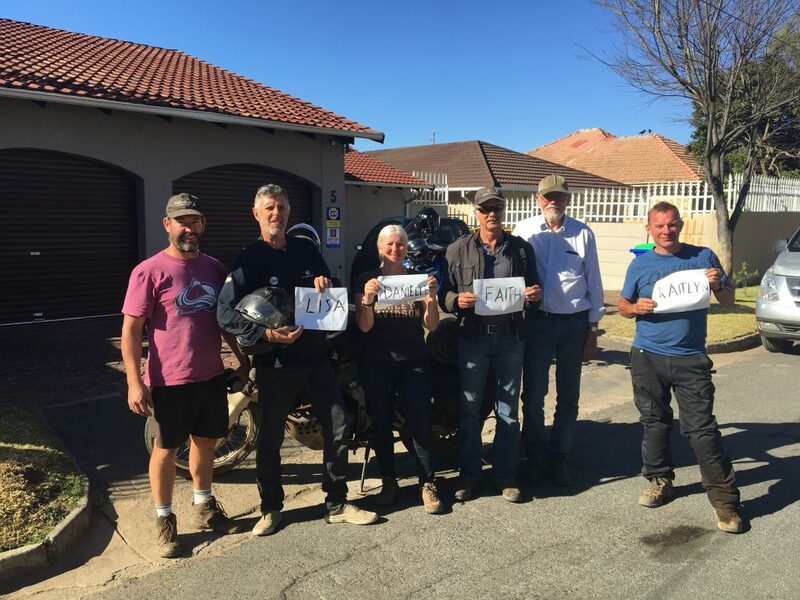 We finished with an awe inspiring hike into the mountains by Andrew’s family place, followed by our final ride into Johannesburg, through a beautiful part of the country. For a change, we took it slow and enjoyed every minute of it. 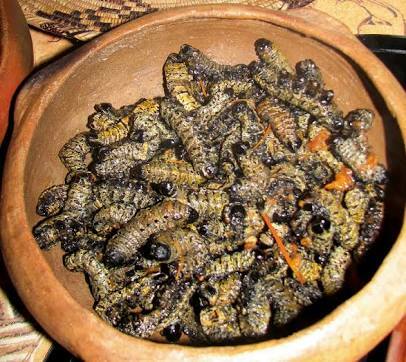 Last night we celebrated with dinner and enjoyed Mopane worms, a local delicacy that surprise surprise, tastes like it looks. All the team had their own reasons for taking the ride. 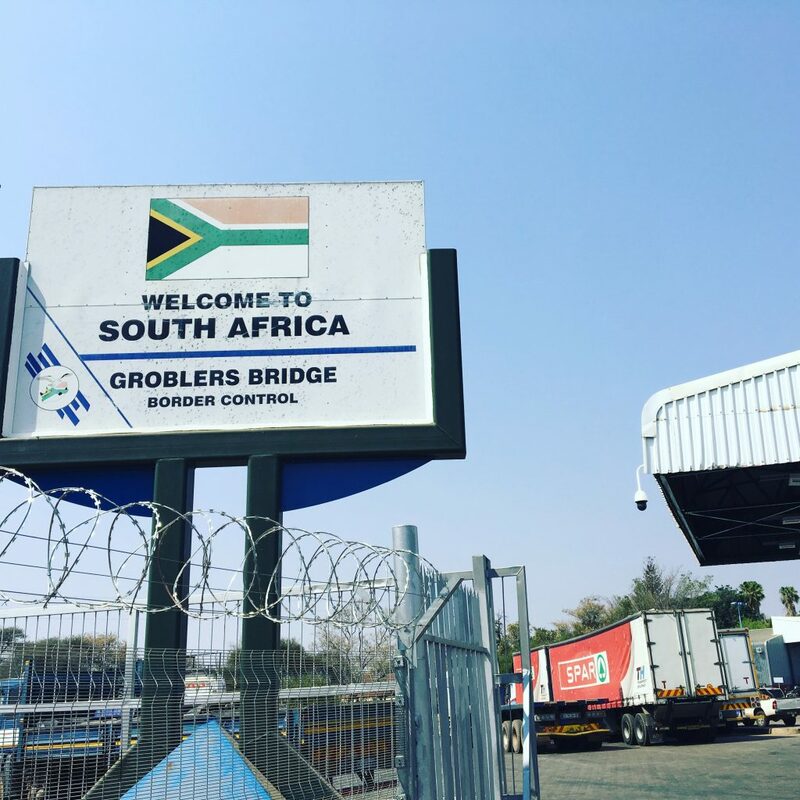 For me, arriving back In South Africa was the culmination of a great circle begun three years ago, when I rode from SA to Rwanda. 18,000 kilometres later, the circle feels complete. I set out from Kigali with a few objectives. To not dump the bike. I failed that one and dumped it six times, including being run off the road by a bus. I may or may not have had a passenger that day. No one was hurt but it was a bad moment I can now write about, with apologies to my passenger friend...should there have been one. To cross off a bucket list item and fill up my passport before it expires. Did it but ...ummm....how do I get out of here?. To go on a long road trip and for the first time ever, not lose my sunglasses. Sunglasses firmly in pocket. To not get a fine from a dubious traffic cop. It took some persuading, a few selfies and an invite to one guy to my house for Christmas, but challenge complete. And finally, to see where the road led me and what I would learn. There was so much. i learnt once again that you can put a group of people together who, with a few exceptions, don’t know each other that well and you can build a team. You see, a team isn’t a group of people who work together, it’s a group of people who trust each other. Navigating our way across eight countries on some of the roads we took, staying in new places nearly every night, experiencing challenges we had to surmount every day....no matter what it was, this team took it in it’s stride. We literally trusted each other with our lives and finished with friendships that will last a lot longer than the five weeks we were together. I learnt once more that it’s not comfort and security that brings out the best in us, it’s challenge. It’s the urge to go a little bit further, to do something a little out of the ordinary, to stretch ourselves and enter uncomfortable ‘now how do we get out of this?’ places....this is what allows us to thrive. Sadly, we’ve created a society that insulates us from challenge and risk. It isolates us from nature and the creation we were intended to be part of and robs us of a key part of what it means to be human. Yet being out on the bike, you are part of the essential essence of existence and you have no choice but to embrace it, to take M. Scott Peck’s road less travelled and to see where it leads you and what wits you will need to get there. And I learnt, once more, something I profoundly believe. That people are beautiful. In the last six weeks since I left Canada, I have not met one person who meant us harm. Every single interaction has been positive and people have been unfailingly helpful, delighted to hear about our journey and to share a part of the excitement along with us. Even here in Joburg, my Uber driver to the hotel stayed in the car park to chat and wanted to see pictures. The Nigerian guy who trimmed my very messy hair today, spent an hour talking about how he would love to do such a trip, which led to us to talking about his desire to start a hairdressing school to teach kids a trade. And last night we met friends and family members of Andrews, all of whom are doing remarkable things to make a difference and help people. My gosh, I have no words for how great the human race is. There is a feeling abroad right now, fanned into flames by cretinous, corrupt politicians and media personalities, many of whom are so uniformed that they can’t even pronounce the names of some of the countries that we have ridden through, that ‘the others’ are bad, that we are better, we are special. That we should fear and attack them to protect ourselves and our own superiority. It’s true. We are special. All of us. Every single human being is remarkable and wonderful and unique and brilliant and priceless. So don’t listen to those idiots. They answer to you and I, not the other way around. Don’t give them the time of day and don’t believe the lies they peddle. We are all the same, each of us with our own individual stories, all of us trying to find our place in the world, all of us needing the help and support that we can provide each other, whether we know it or not. 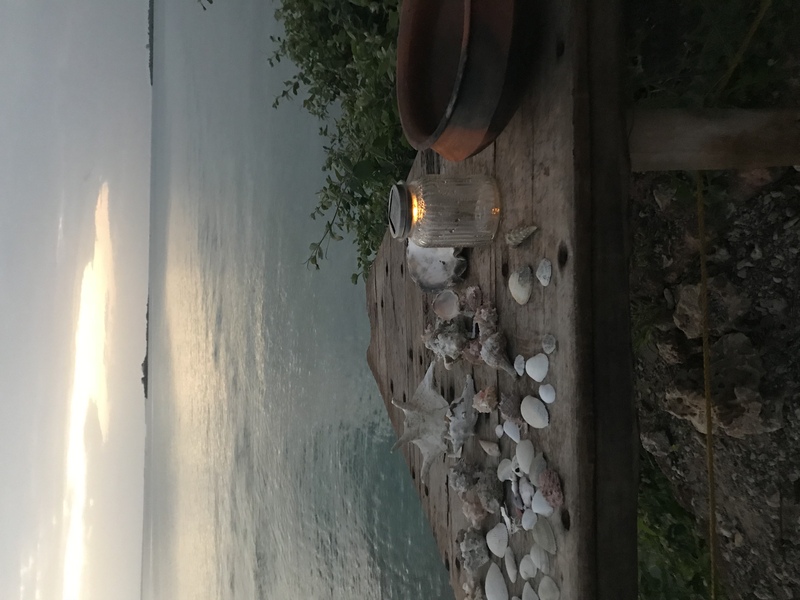 A trip like this changes your perspective, your view, your very being, as you grapple with the simple truth that we are all in this together and that injustice and inequality must be addressed wherever we find it. One thing it has confirmed for me is that the work we do in education is crucial, and that particularly, our focus on empowering girls, working to give them the opportunities that boys have and to liberate their potential, has the possibility of changing everything. During this journey, i have strengthened a personal commitment I made two years ago to dedicate myself to this goal and will do all I can to be better at fulfilling my tiny part in it. So I have question for you as I close. What is your Kigali2Joburg? What is the challenge you need to accept, the risk you need to take, as you consider the paths before you? What is the thing you are thinking about doing that will lift you out of normal into the realm of trust and belief, the place where in your extremity, you can reach out and touch the face of God and see again what you were intended for? Whatever it is, please allow me to encourage you to take the leap. To reach out for the thing that will bring transcendence and transformation, to take the restless path that will lead you to the high places we so often miss. .You won’t regret it. After all, what have you got to lose? Thanks for riding with us. It’s been a blast. Posted in Ride on August 28 by Andy. Botswana is beautiful. I know, I say that about every country we go through, but let me tell you...Botswana is beautiful. Mind you, it has some diabolical tracks as we found out when we negotiated our way into Senyati Camp yesterday afternoon. Leaving the brand new motorbike loving road we had ridden from the border, we turned off for a short 5K ride into our camp, not knowing it would be the worst 5K of the trip. A few hundred meters from the road, we ran into deep sand. I hate sand. It’s a bikers worst nightmare and this stuff was talcum powder like. And did I say it was deep? It took every iota of our energy to hold our half ton bikes up as they skidded out from under us like recalcitrant dogs, trying to escape their leashes. Once or twice they did. One moment we were sliding sideways trying not to topple over, the next we were dug in up to our wheel hubs trying to get out. Even worse for me, Mrs. Smith has a stubborn fan which didn’t kick in, meaning that in the 40 degree heat, I had to keep stopping to let her cool down. At one point I found myself alone, dug in so far that she was almost standing up on her own, with a herd of Zebras galloping by. I couldn’t decide if it was heaven or hell. Somehow, after what seemed hours of muscle searing effort, we made it to the camp, panting and gasping for air. Wes, Lenard and I just looked at each other shaking our heads, knowing we had to do it all again in the morning. A little morose and desperate for a drink of water, we headed to the bar. And that’s when the magic started. 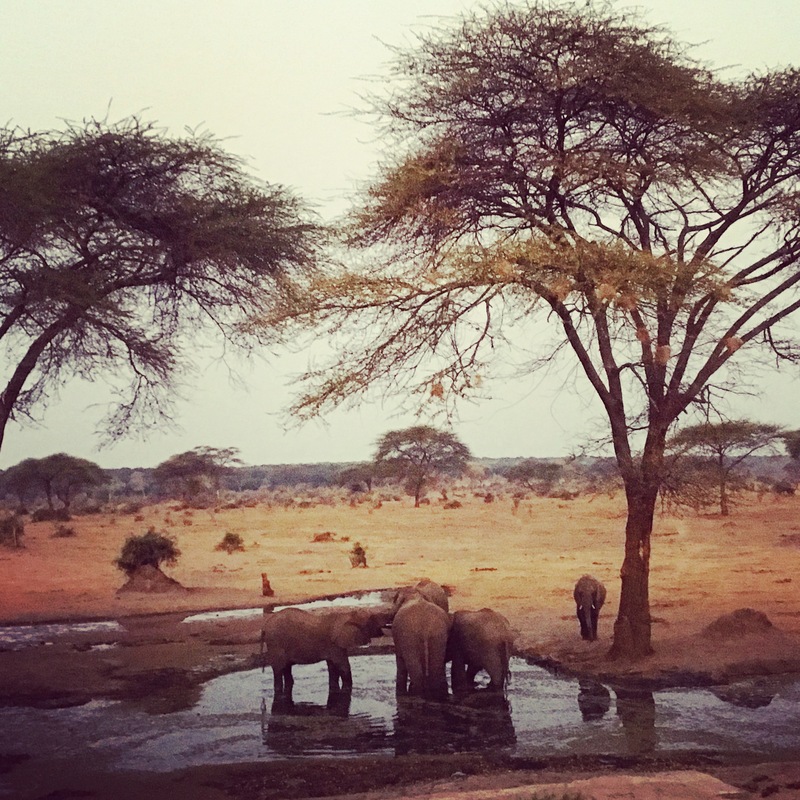 Senyati camp has a waterhole just beside the restaurant and all of a sudden an elephant ambled by. And then another. And another. 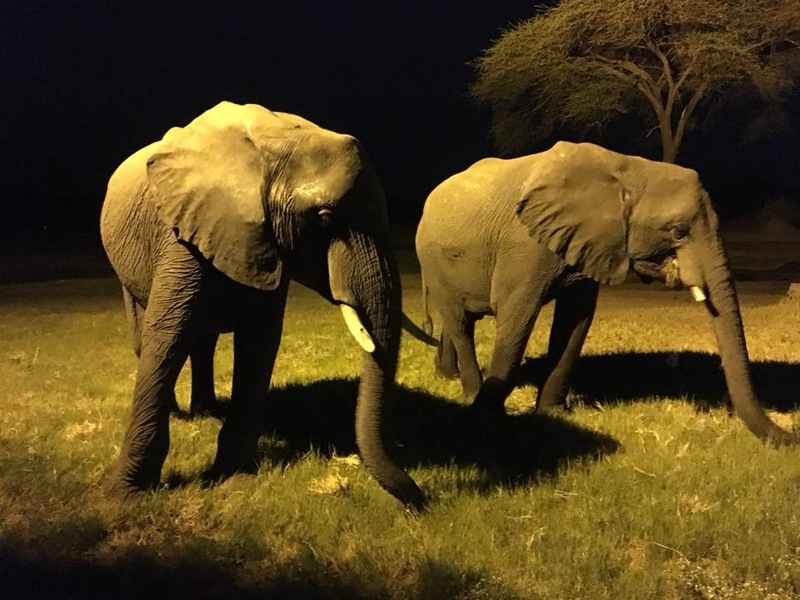 It was sensational, just sitting there, no fences or barriers, just us and the elephants. I remember thinking this is incredible, it can’t get any better than this. So majestic, so magical, so perfect. After a fabulous dinner cooked by Andrew [who knew he was Gordon Ramsey in disguise? He’s been holding out on us), we went back for another look. 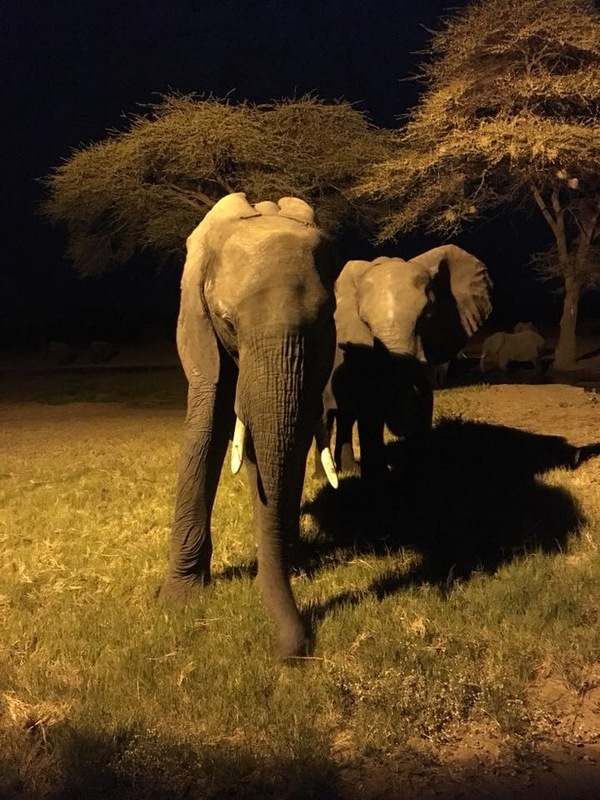 In the dark, the water hole was lit up by soft yellow lights and out of nowhere, a whole herd of elephants appeared, bulls, babies and mothers. We stood on the lower level, mesmerized as they came ever closer. And closer. And closer. At one point a pair were no more than five feet away from us. It was as though we had been transplanted into the middle of a Planet Earth film and I half expected to hear the voice of David Attenborough, breathlessly whispering about the incredible sights we were so privileged to see unfolding before our eyes. I found myself eye to eye with a bull elephant, right within touching distance, and I felt something shift in my soul, something deep and profound that reflected the glory of creation that I and the elephant before me are both part of. I was in my own world, completely hypnotized by the splendour unfolding before me, until I looked around and realized that there were many others from the camp there. All of us, standing in complete silence and awe. The only thing I could hear apart from the elephants eating the grass they were pulling up wth their trunks, was the occasional gasp, and the sound of someone quietly sobbing. We stood for ages watching until we wound our way back to our tents, still in silence, unable to speak. 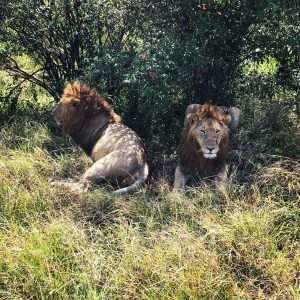 I lay awake a lot of the night trying to comprehend what I had seen, listening to the sounds of lions roar just a few hundred meters away. What an incredible, luminous night. There was a dark moment during the ride in when I had wondered if I could make it. My bike was stuck, I was on my own, the engine was boiling and I was literally shaking with the effort it was taking to keep going. It seemed impossible. Yet it was only because we pressed on that we had an experience that we will all treasure forever. Life sometimes throws the tough stuff at us and we all want to quit, to go back to the road we know we can handle. To maybe just stop where we are and give up. But it’s when we press on that we discover things that we could never have dreamed of, things that can change the way we look at the world, that can challenge our preconceptions and our very way of being. Last night showed me that the challenges, however tough they are, can lead to things that seem impossible, to sights that will always remain unseen if we give in, yet are waiting for us to revel in if we just go that one extra step more. I will never forget the night of the elephants and I will always remember the spiritual experience of being there. But I know I would have missed it if I had given up. 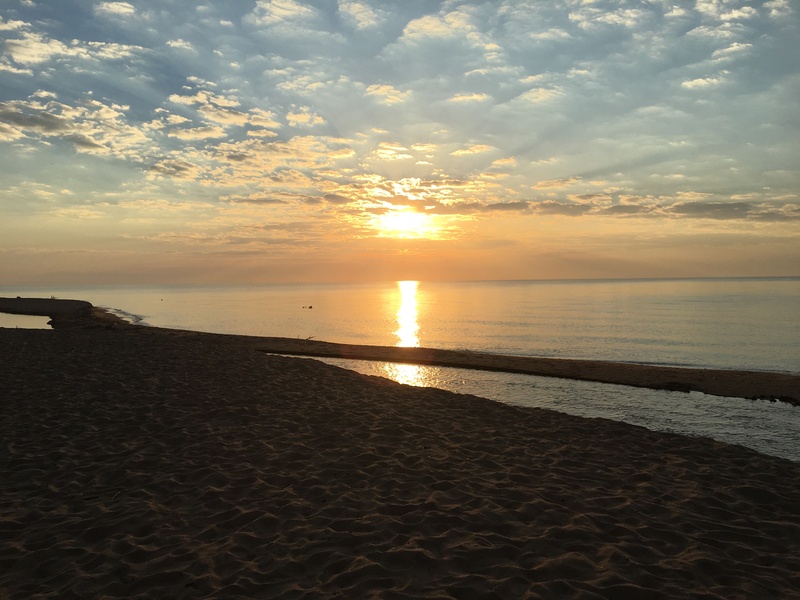 So if I may be so bold, and without wanting to minimize the tremendous challenges you may be facing, please, allow me to encourage you through whatever makes up your own bogged down, fear inducing sand trap today. I know it’s not easy and I know how simple it seems to give in, to believe it’s just too hard to keep going. But please, don’t do that. Don’t believe the voice in your head telling you that you can’t make it. You can. So Gun the throttle, keep the bike upright, don’t fade out, no matter how hot it is and how much you want to stop. .Keep going, keep pressing on. 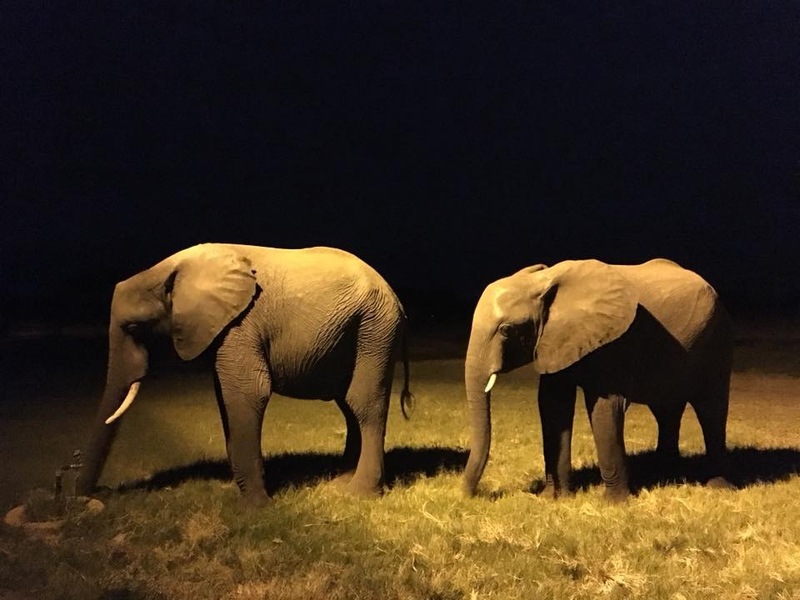 The elephants are waiting for you just down the road. Believe me, you don’t want to miss them. Posted in Ride on August 25 by Andy. 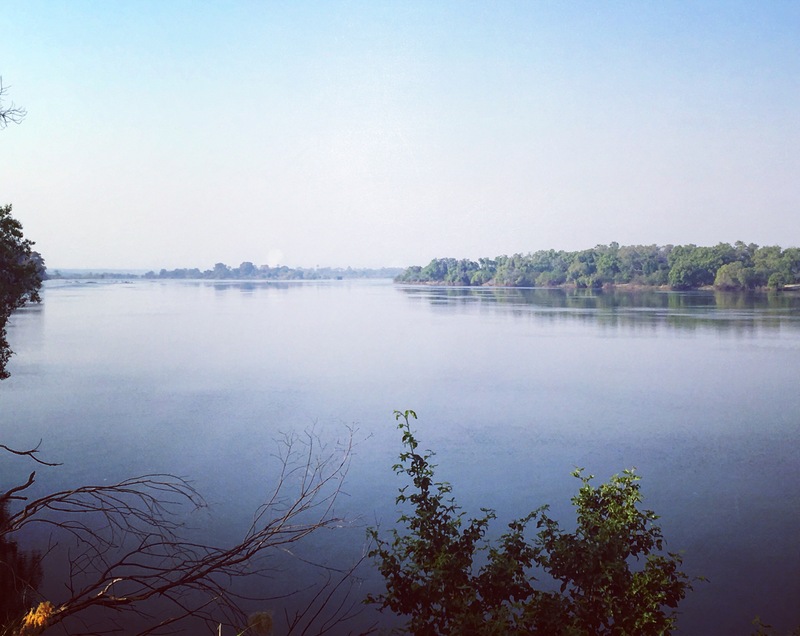 It’s a beautiful morning here on the Zambezi River, just above Victoria Falls where we are staying for two days. 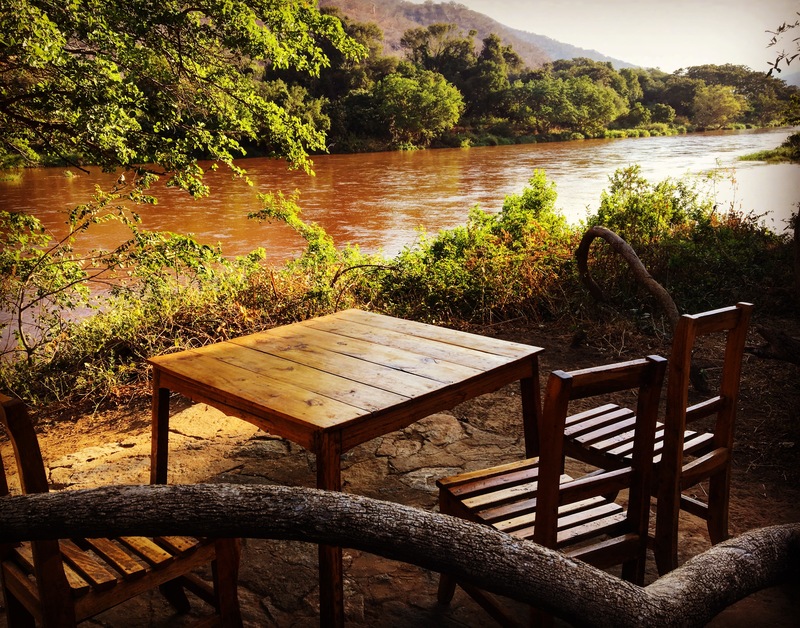 We’ve already seen wild elephants outside the gate of our lodge and I’m sitting just across from crocodile and hippo territory. It’s spectacular. We rode in yesterday after two long but beautiful days riding through Zambia from North to South. 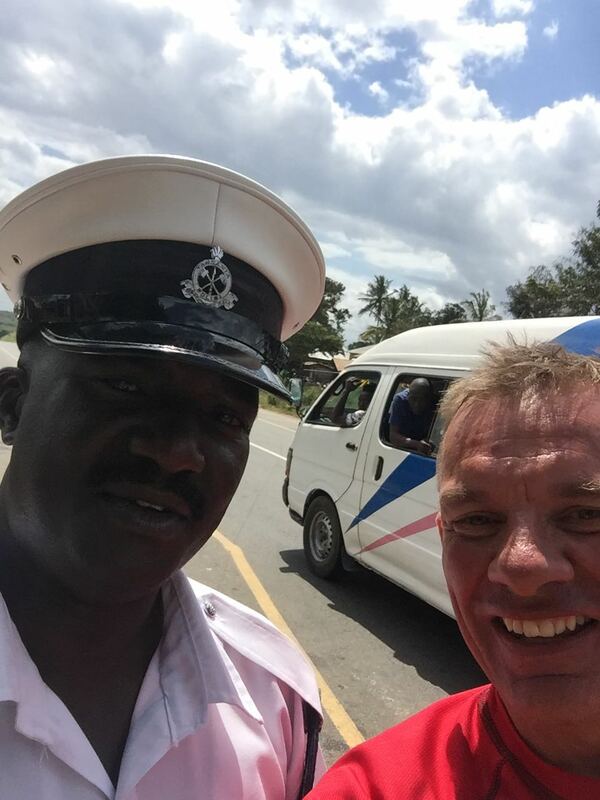 Apart from traffic cops who do like to add to the local coffers [though we were mostly successful at charming them out of fining us], we have had a fabulous time in this wonderful country. It’s my first visit here and I already know I want to come back. We rode past beautiful vistas and through mountain passes, though at one stage we did have to ride 80km through a forest fire. It was already in the 30’s in the shade and the heat from the fire semi baked us. We were down to Tee Shirts and still dehydrated, but the swooping valleys and forested heights we rode through were a massive highlight of the trip. The bikes ate up the brand new banked tarmac and it felt like we were having a summers track day on a Formula One circuit, sunburn and all. Brilliant! 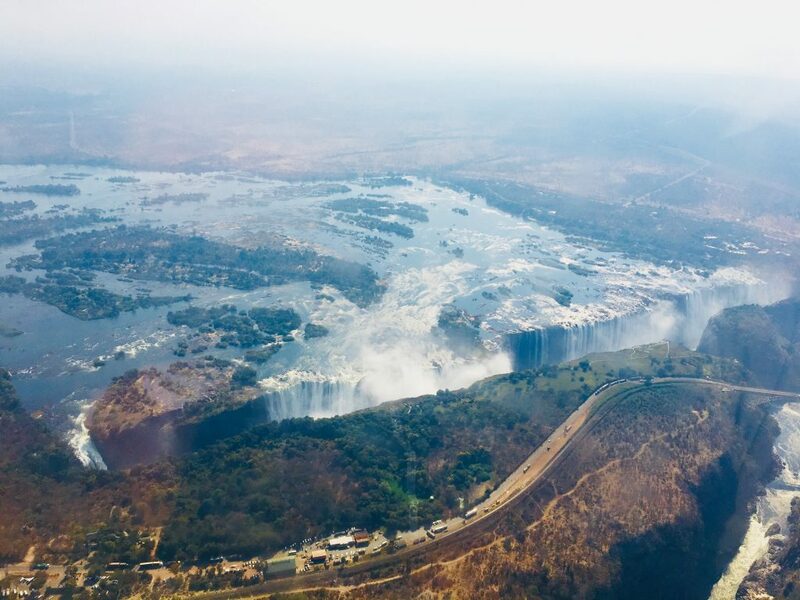 Today is a rest day and we just took a thrilling helicopter ride over Victoria Falls, including a G Force filled, Star Wars like run down the canyon over the rapids. I think R2D2 with a British accent was at the controls and I’m sure Darth Vader was chasing us. As good as they are, it made the bikes seem pedestrian. Ummm.... Helen, any chance of getting....okay, never mind. “Zambia has one of the highest child marriage rates in the world with 31% of women aged 20-24 years married by the age of 18. 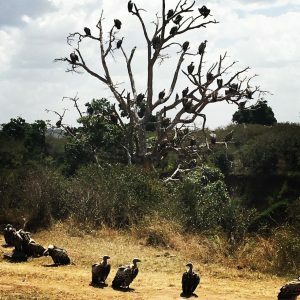 The rates of child marriage vary from one region to another, and are as high as 60% in the country’s Eastern Region, and as low as 28% in the capital of Lusaka....It may even be more prevalent than we think, as the birth registration rate of 14% makes it difficult to tell the exact age of millions of girls. Child marriage in Zambia is driven by traditional practices and beliefs, and the low social status assigned to women and girls. Initiation ceremonies for girls who reach puberty prepare them for marriage and gender responsibilities as defined by culture. Cultural practices such as polygamy also add to the problem, as young girls are married off to older men who are respected in their communities. Poverty also exacerbates child marriage. Over 60.5% of the population live below the poverty line, and families see child marriage as an opportunity to benefit financially from the bride price they receive for their daughter. Although 21 is the minimum age of marriage for boys and girls, they can marry here at 16 with parental consent. However there is a customary legal system that allows girls to be married as soon as they have reached puberty, which causes huge problems for young girls. 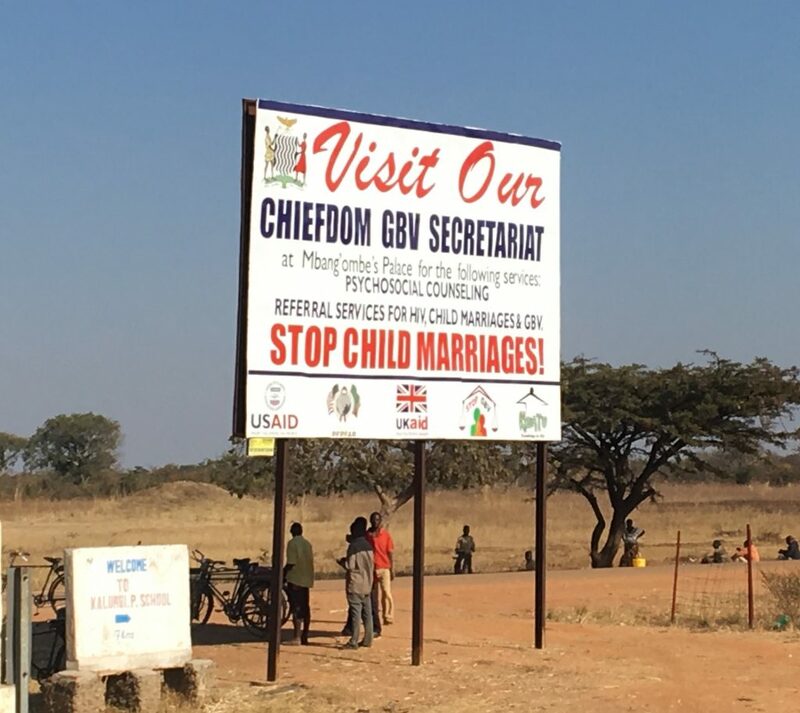 Zambia is trying to combat this and as a proud Canadian Brit, I am glad to say that in 2013 Zambia co-sponsored with Canada the first UN General Assembly resolution on child, early and forced marriage. The two countries co-sponsored another resolution on the issue at the UN General Assembly’s 69th session in 2014. Yet again it shows me that education is the key to changing so much, especially for girls who suffer in ways that are invisible to those of us from a privileged background, which includes imost of us reading this post, whether we realise it or not. On this trip I have been constantly reminded about the fact that it is one of the biggest drivers to ending poverty and teaching values that can change the way we view each other and indeed, the world. Education truly changes everything. 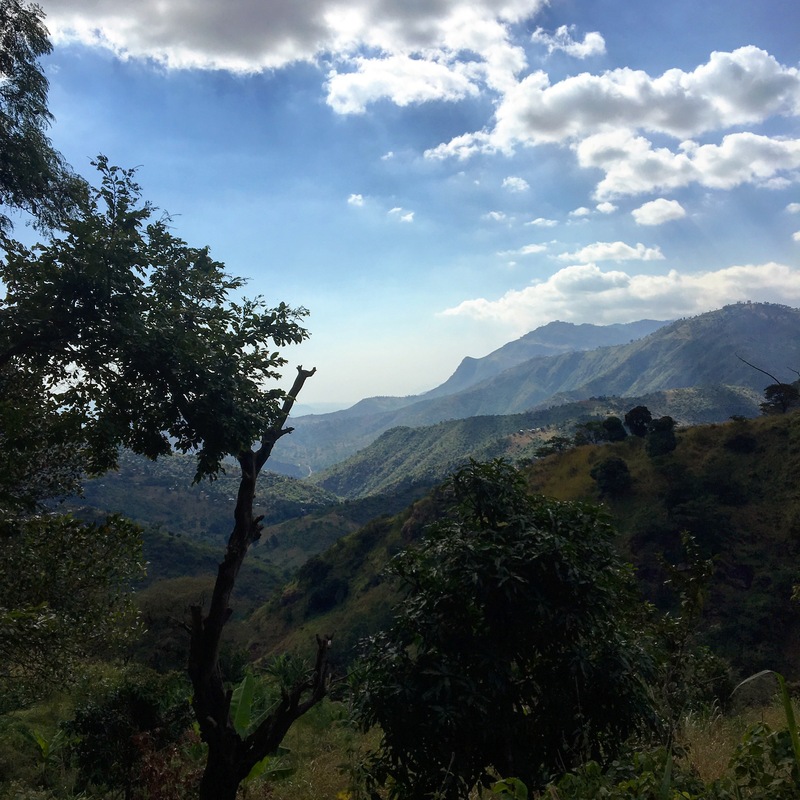 I’m proud of the work that Wellspring does in Rwanda but once again, I realize we need to do so much more and I’m inspired to push further on a journey that makes the Kigali2Joburg ride pale into insignificance. I hope you’ll come along for that ride as well. [You can help Wellspring in our work of providing a quality education for hundreds of thousands of young children by sponsoring the Kigali2joburg ride here]. Posted in Ride on August 23 by Andy. Even The Undercover Police Are Nice. 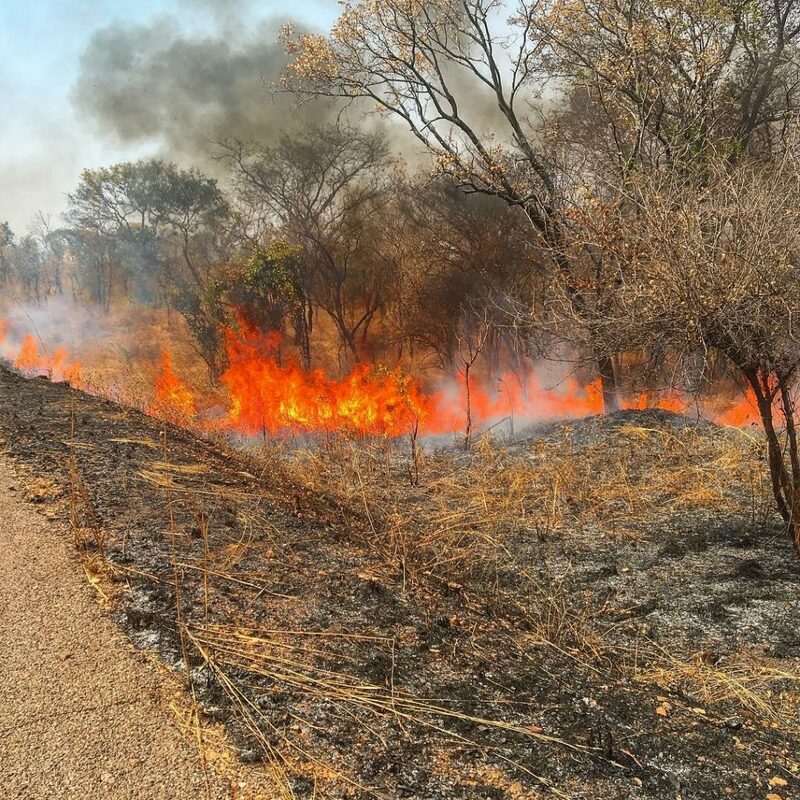 Zambia! It’s a new country for all of us except Zen Motor Master Andrew and it’s helped me realise a long held ambition. 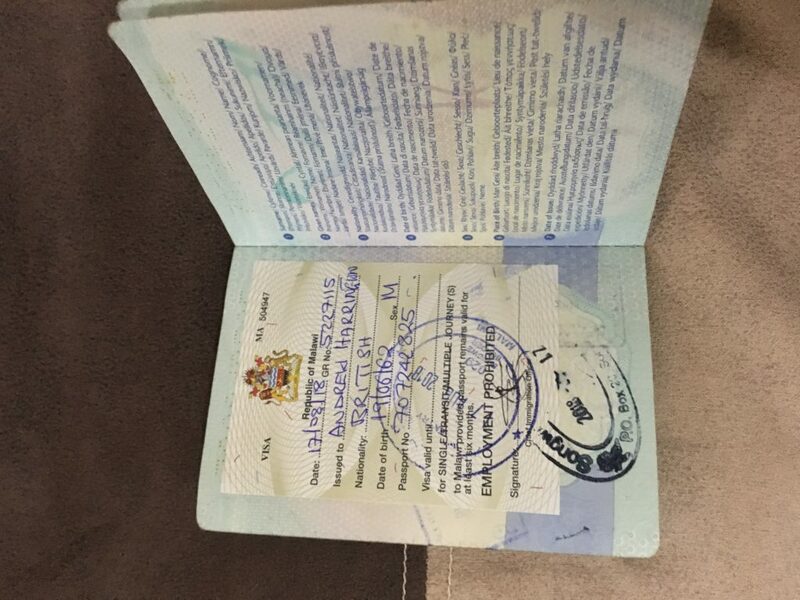 I have filled a passport! Which is awesome as I can cross it off the bucket list, but not awesome I still have two countries to go. 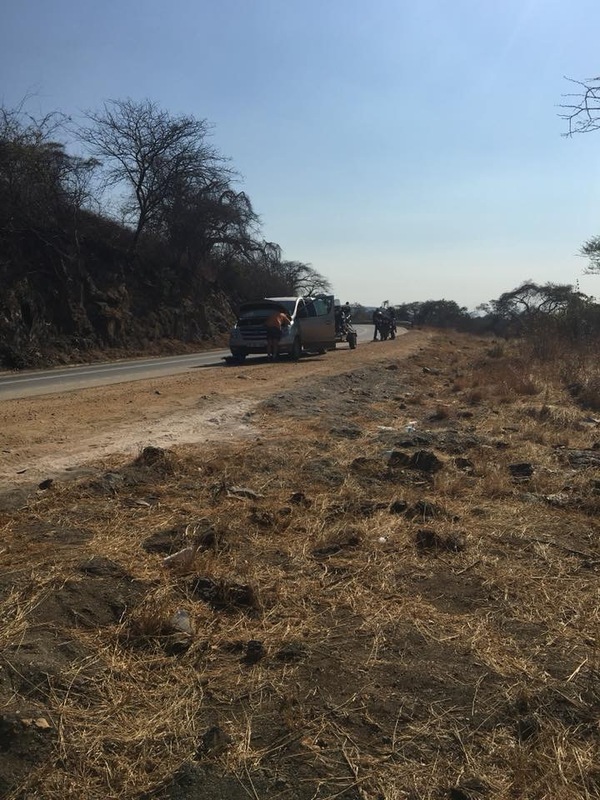 Another interesting thing that happened at the Malawian side of the border was that we were mobbed with money changers and fixers, something that often happens. We don’t normally do anything except say no, which they don’t accept until the no gets serious. But this time, two undercover cops jumped in and they ran away, which left Les and I as a potential criminal masterminds. The police started to place me under arrest for black marketering and I hastily explained that a) I didn’t know it was against the law to talk. B) I hadn’t bought anything and c) I am a nice guy who is trying to raise funds for education and that we should all hug and have fun. It took me ten minutes of negotiation but by the end they were laughing and trying to get me to bring Wellspring to Malawi. I nearly got a selfie with them but they thought they might get in trouble. They even waved us off as we left. Lovely people. 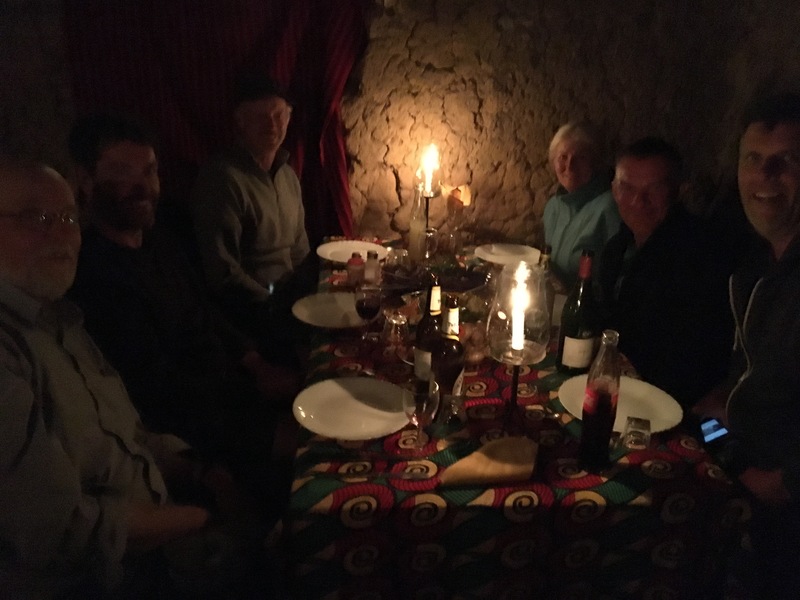 We met some wonderful people including three guys I sat with in the bar last night, two Malawians and an American peace corp volunteer who is working on environmental community development projects. We had a side splittingly funny conversation about Advocados that even included cartoons and animated role play. I also sat with Ollie, a British teacher volunteering in a local school who was fascinated about what we do in Rwanda. I love meeting people like that who are doing all they can to make a difference. You find them all around the world and they make it a better place. They inspire me and I am always humbled when I hear their stories. Ollie also wanted Wellspring to come to Malawi. Posted in Ride on August 20 by Andy. The Hidden Message Behind The Waving Girls. 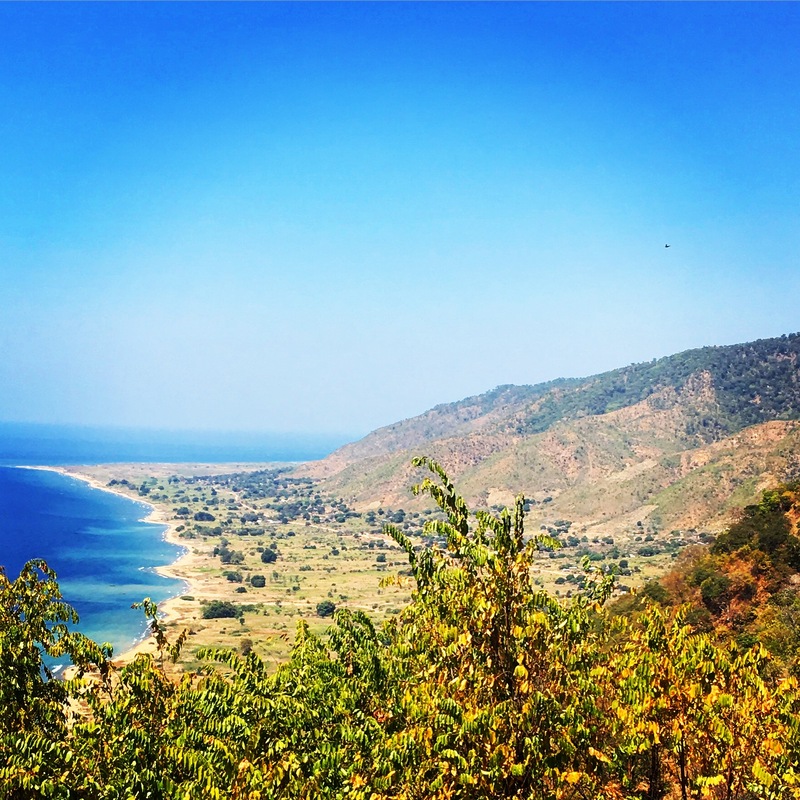 So here we are on beautiful Lake Malawi. 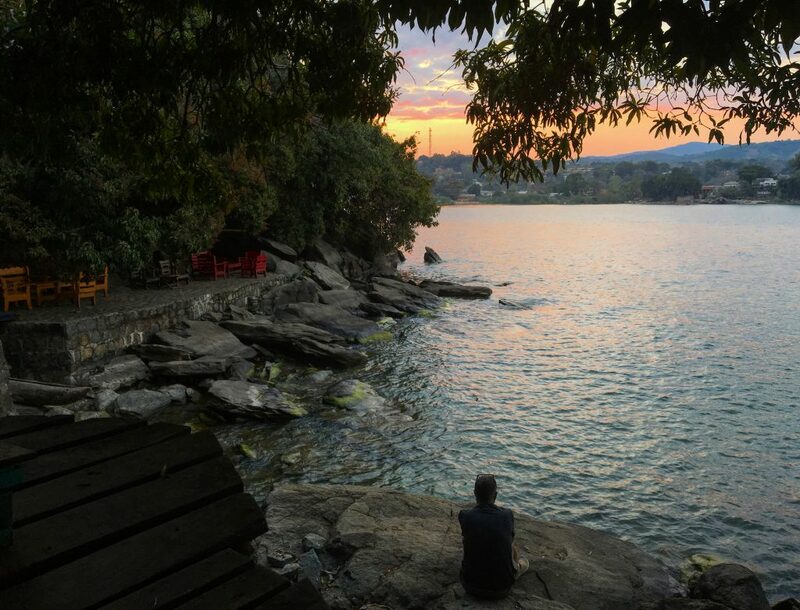 Now that we’ve completed over half the distance of the Kigali2Joburg ride, we plan to take it a little easier over the next three days and cruise down the lake, stopping for a couple of days at Mayoka village to take in this wonderful Maui-Esque place. 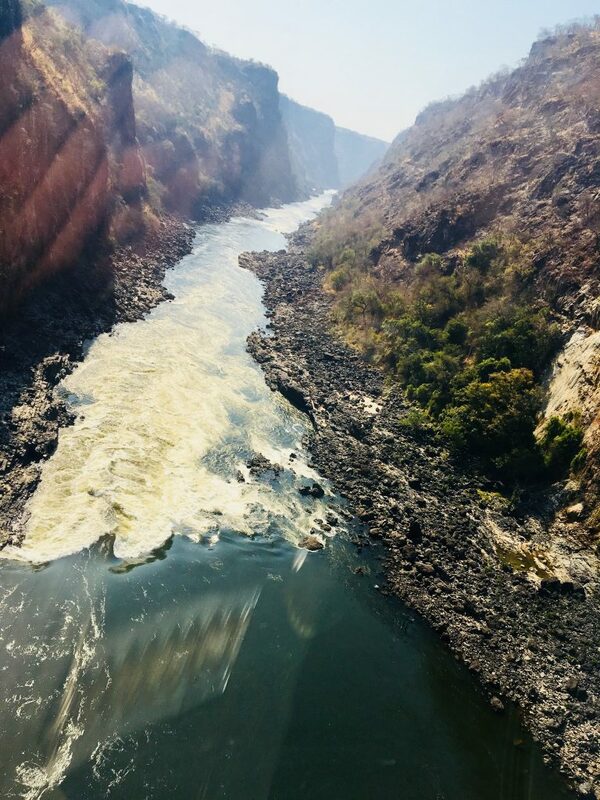 Then it’s onto to Botswana, Zambia and our next two day stop at Victoria Falls. The route has really been superb and the excellent planning that Andrew of Ride Down South has done has all paid off, as has his hard work on maintaining the bikes. 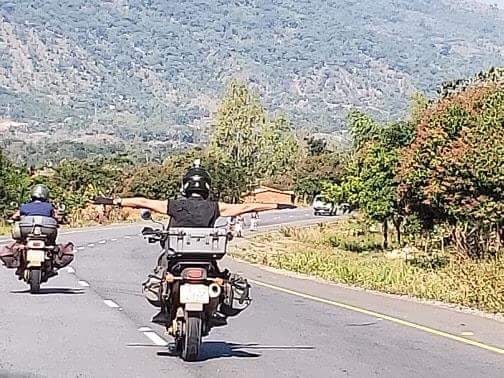 They have now done well over 10,000k of African roads and tracks on both the ride up to Kigali and back again and they show why Africa Twins are a great choice for a crazy adventure like this (though I still love my KLR!). A few small maintenance issues, but they are making it happen, especially on the sand slalom into our camp last night! Now that I have time to pause, I’m reflecting on something I and Wellspring have been thinking about for a while, that is coming into focus on this trip. Everywhere we go in East Africa we see girls along the street. We wave and they wave back, but you have to ask, why aren’t they in school? The truth is that, often girls don’t receive the same education as boys, who are prioritized by many parents due to their earning potential and the still prevalent patriarchal culture dominant in many parts of Africa. As a result, girls are often taken out of school to look after younger siblings so that parents can go to work. Also, even though many countries offer universal education, there are hidden fees such as uniforms, books, exams and others that place the costs of educating all of a families children beyond the ability of many families living in poverty. In these cases, it’s the girls who suffer most and are first to have their school places taken away. As a result, girls face many challenges and dangers including the possibility of sexual exploitation, human trafficking, the daily grind of living in poverty and abuse of every type, including high degrees of gender based violence. One’s Poverty Is Sexist Report shows that Globally 130,000,000 girls are out of school. That’s a HUGE number. It would take 5 years of non stop counting to get there. An additional year of schooling for girls is estimated to result in an almost 12% increase in wages. A dollar invested in an additional year of schooling, particularly for girls, returns earnings and health benefits of $10 in low-income countries. For less than the cost of a loaf of bread each day, a girl in the world’s poorest countries could go to school – a small investment that could change the world. In sub-Saharan Africa, fertility rates fall to 3.9 births for women with a secondary education compared with 6.7 for women with no schooling. (Source, One: Poverty is Sexist report 2017). So I keep looking at all these girls waving as we ride by when they should be in school and wondering what is our role is in all of this? We can’t just let this continue. At Wellspring, we have made a commitment to have a far greater focus on girls education and have set targets we want to see achieved in our new Rubavu District project in Rwanda, where we are working with over 90,000 children. We want to see girls graduation rates dramatically increase and we want to see some of the attitudes towards them change as we focus on building community values and development. It’s a start, but there is so much more to do. As a white male, I am a recipient of all sorts of privileges and I am reflecting more and more in what that means. On this trip I am taking my cultural glasses off and trying to understand the power dynamics I have benefited from and what my role is in trying to redress the balance. I have a long journey ahead both in kilometres and understanding and despite my inadequacies and in built biases, I want to do my best to take the right road. I hope we can take it together. Posted in Ride on August 18 by Andy. Well it’s been an interesting few days of adventure. We ended up having to stay an extra day in Dar Es Salem after a very rough ride back on the ferry from Zanzibar. So rough in fact that I had the joy of finding out what my fellow Tanzanian passengers had for dinner the night before. Truly, we are all the same on the inside. Getting out of Dar was a nightmare with endless traffic jams in scorching heat. My bikes fan decided it didn’t want to go to spin class so my temperature gauge was pegged in the red, which meant endless turning it off and turning it on again. It might work for computers, but not for motorbikes. By the way, we’ve noticed that a certain South African has named two of his bikes Laura Croft and Jolie. So, noticing a trend and bearing in mind her temperamental nature, my bike is now called Mrs. Smith. Eventually we got out of town and hit some beautiful country. 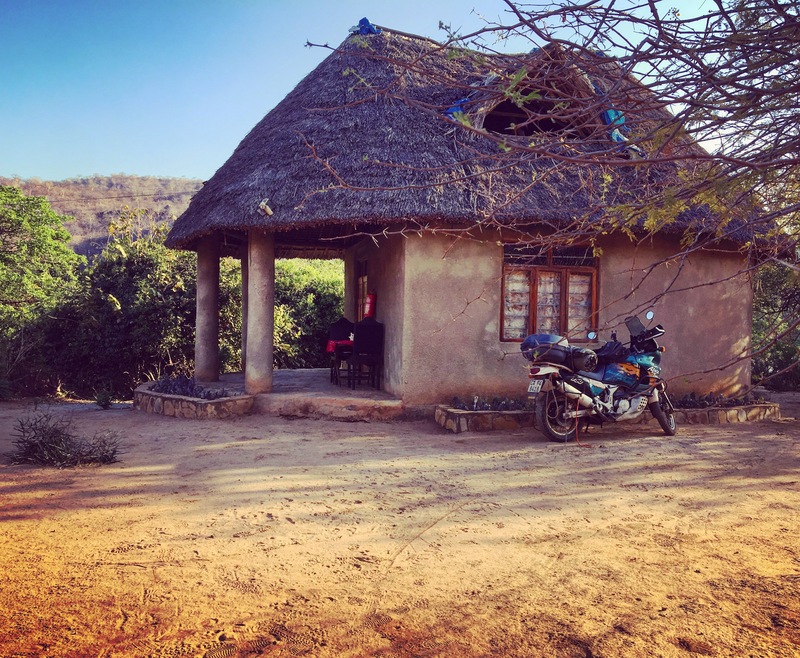 We rode 400k through Mikuni National Park past Giraffe and Zebra, then into the stunning Valley of the Baobobs and stopped at Crocodile Camp, an oasis we found in the middle of nowhere, run by the wonderful Frank and Jennifer. 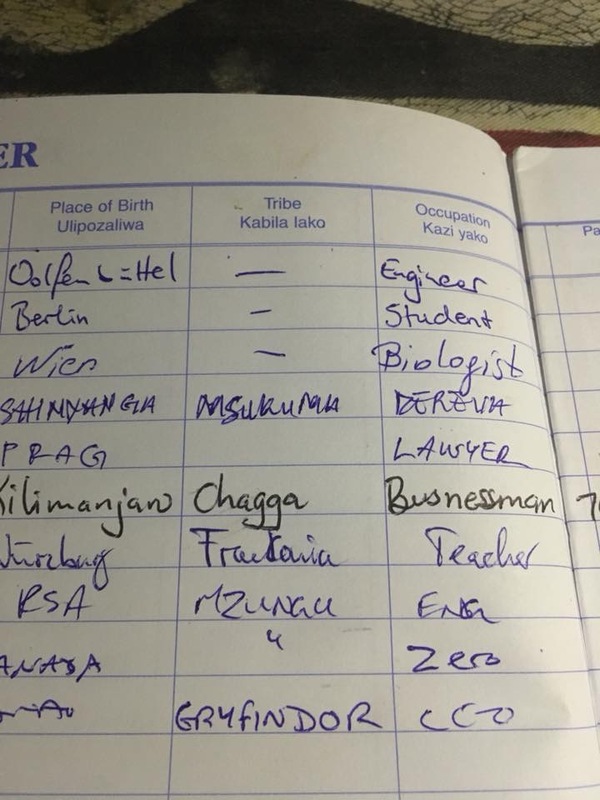 They cooked us a beautiful meal and exhausted after a baking day, I fell asleep in a camp armchair, but not before filling in the required box in the registration that asked what tribe I was. Gryffindor of course. We planned an early day and were on the road by 7:30. And that’s when Frank and a Jennifer became our saviours. As well as the three bikes, Andrew and Les follow along in Herbie the Adventure Box, where Danielle and Faith also used to hang out before they saw the light and moved to Zanzibar. Andrew calls it that because he says that’s what it’s like when his dog gets into it. She hasn’t got a clue if she’s going to the park, or the beach, or the vets to get a great big needle jammed up her....whatever. It’s just one big adventure. Generally we don’t have a clue what the day holds either. But today, the adventure box went to the vet. 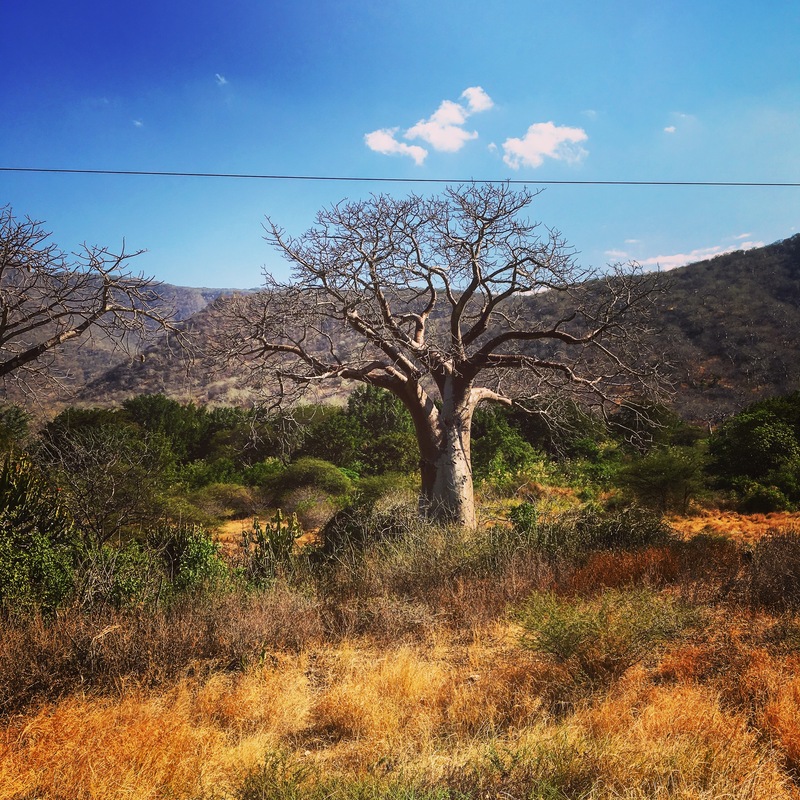 50km down the road in a desolate stretch of Southern Tanzania the motor cut out and the adventure box ground to a halt. We all pulled up and offered various advice to expert mechanic Andrew, who was no doubt overjoyed to get it. Two hours later still no joy and even the Zen motor master had to admit defeat. So off Lenard, Lee Ann and I rocked on the bikes, Mrs. Smith running hard for Crocodile Camp to find help. And help we found as Frank came to the rescue. Jumping into his truck. He took of like a scorched cat, with Mrs Smith doing her best to try and keep up. Poor thing, she just doesn’t have the stamina. By the time we got to the adventure box, he had contacted a mechanic who we picked up on the tow back. Genius guy! He fixed it in an hour. It’s interesting that in Canada, we would have needed a new part, (an electronic control unit to be precise) but this resourceful Tanzanian small town mechanic figured out a fix and got the box running. I guess our disposable society isn’t so awesome really. 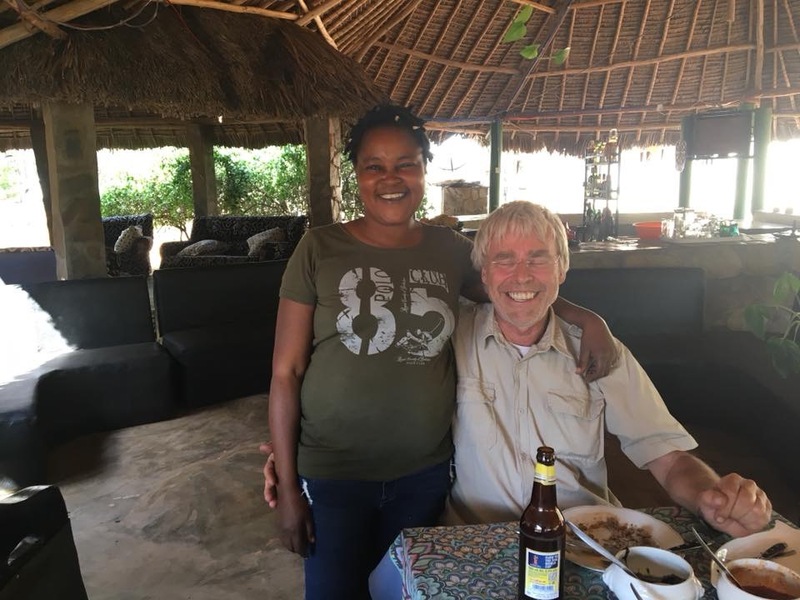 I had already ridden 200km back and forth and found myself sitting in the same armchair I started from, so at 3:30 pm when we hit the road pretty hard, I told Mrs Smith she had to get me 170 km to Iringa, before dark or we were looking at a divorce. And this is where she got me. We’re camping at 6,500 feet up in the mountains, which is a bit chilly, but what a super fun little camp restaurant. We’re eating a three course meal, having a nice drink and hey, we’re still smiling. It’s true that if you put the right face on it, life is always an adventure. Especially in Herbie, the adventure box. Posted in Ride on August 16 by Andy. Dignity, Justice and the Journey. Well here we are in Zanzibar, half way through the kigali2joburg ride. There is actually another 800 km until we are half way through in distance, but this is the point we set ourselves so that we could have two days of much needed rest. I am sitting in a thatch covered shack right by the sea, in the very vibacious Air BnB we are staying at in the Northern part of the island. 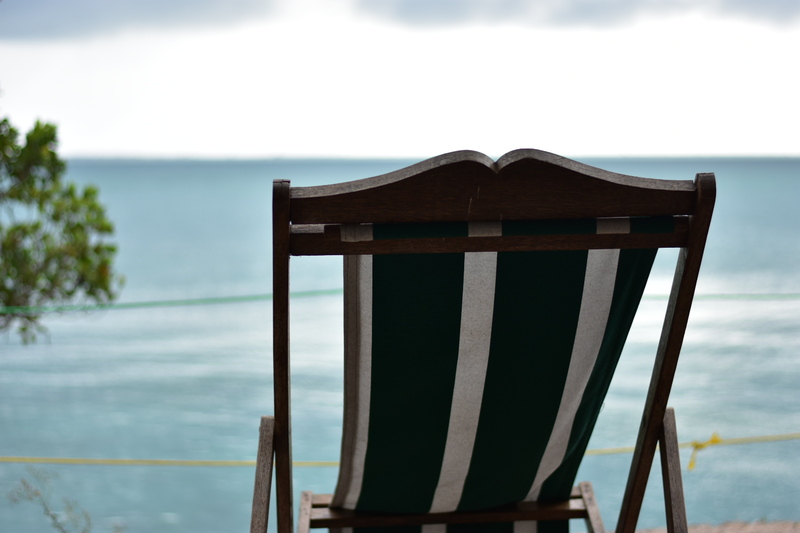 No bike to get up and pack, no mechanical problems to sort out, just a day of sun, sea and sand. Bliss. And it’s also allowing me time to reflect on the meaning of a journey like this. 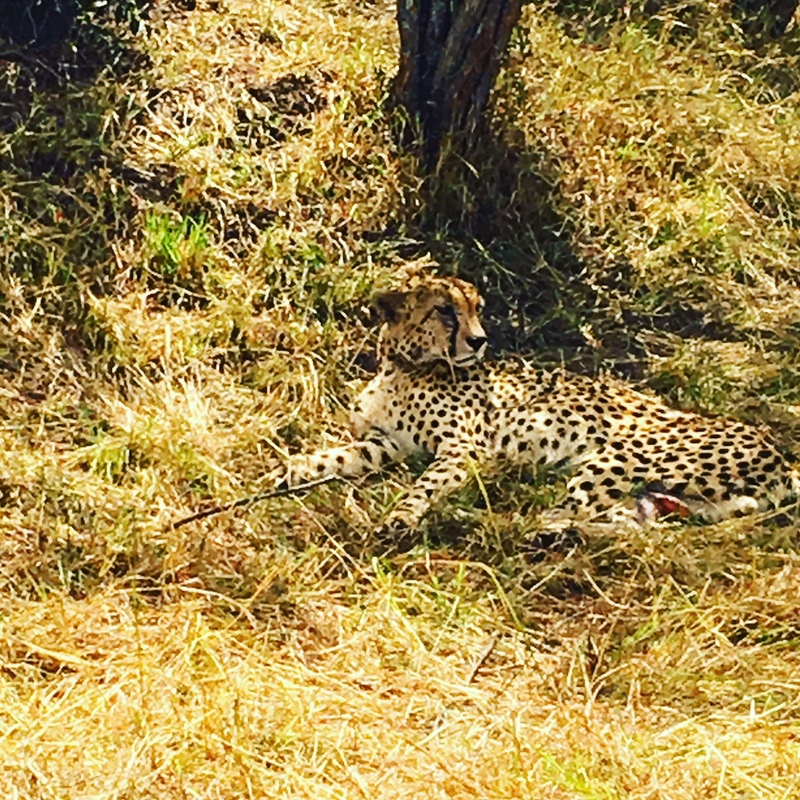 It’s an amazing thing to have the opportunity to see Africa from the outside. That’s kind of what it feels like on the bike, that you are in the elements, not watching from the inside of an air conditioned cocoon. Actually present and experiencing everything in the raw. You ride into endless oceans of views, punctuated by mountains and valleys, open plains and tropical rain forests, until you reach an actual ocean, sunset glistening on the waves lapping against the beach. It is a thing of beauty. And the people you ride with as well as the people you meet, make it an even more luminous experience. It’s an interesting place that we have traveled to, not just in terms of the geographical destination, but also in terms of a spiritual and emotional waypoint. As a group we have bonded in a way that you never could just by meeting for dinner or having a coffee. We have helped each other when a bike has had mechanical issues. watched each other’s backs as we have worked our way though crazy traffic, made on the spot calls as the route hasn’t worked out as we thought. My friends picked my bike up three times when I had a bad day and my off road skills decided to have their own vacation. We have been a team. We’ve also learned a little about the people who inhabit these lands we have ridden through, people who know so much more than we do in so many ways and who we are trying to learn from as we go. Every conversation proves that we are all the same at the core, all with our own stories and experiences that make us unique and special. It doesn’t matter if you are a Kenyan, a Ugandan, a Rwandan, a Tanzanian or a Canadian. All of us belong. We use a phrase in our work to describe this sense of belonging. “There is no other, there is just us”. All of us together, no matter what the colour of our skin, our race, or religion. We are all beautiful human beings, and I choose to believe that we are all made in the image of God, all loved by Him equally, whatever we choose to believe. That we are all worthy of respect and dignity, all valued equally. It doesn’t matter whether you are a materially wealthy Canadian biking through, or one of the children we see playing in the dust, waving wildly at us. All of us count. All of us are equal. All of us belong. It’s one of the reasons I believe so passionately in our work at Wellspring, as we partner with our Rwandan friends to see justice and opportunity given to the children of Rwanda through the provision of a quality values based education. An education that not only teaches great math or English or science, but also allows whole communities to experience transformation as we work together to create a better world. Everyone should get the opportunities we have in the Global North. It should never be limited to the privileged few, and a trip like this makes me even more determined to do all we can to open the doors to every child, so that they can have a chance to see their lives changed as well. Today also marks our last day together as a full group, with Lisa, Faith, Danielle and Kaitlyn staying on for a few days in Zanzibar. Even as we enjoy this last day by walking across to an island in the distance at low tide, we are not looking forward to parting. Well those four lucky people are looking forward to a little beach time as we load up bikes and ride, but it’s hard to think of the group splitting. I won’t be able to look in my rear view mirror and see Lisa with a bring it on grin on her face as we tackle another off road stretch. Or see Kaitlyn behind me, having my back as she rides so brilliantly and making me wish I was half as skilled as her. I won’t be able to hear Faiths laughter and infectious joy making us all dissolve into fits of giggles, so happy and glad to be here. And I won’t be able to enjoy Danielles rich observations about life, people and culture, insights that have provoked deep questions and conversations about why we are the way we are and how we can become better humans. 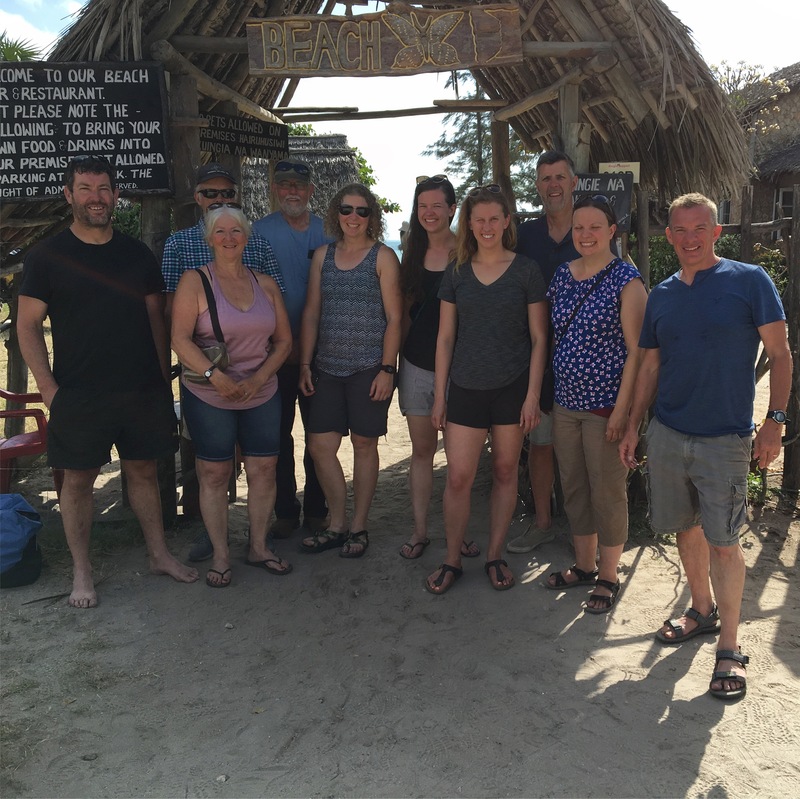 The other six of us will carry on, into Southern Tanzania then onto Malawi, knowing that parting is such sweet sorrow, but that we carry a part of each other with us, as well as the people we have met along the way. It will be hard to ride away from our companions, but part two of the kigali2joburg ride beckons and there is more adventure to come. Posted in Ride on August 13 by Andy. Posted in Ride on August 11 by Andy. Yesterday was a beautiful day of riding. 450 K through the Great Rift Valley and up the East wall, stopping at a roadside cafe to take in one of the great views of creation. 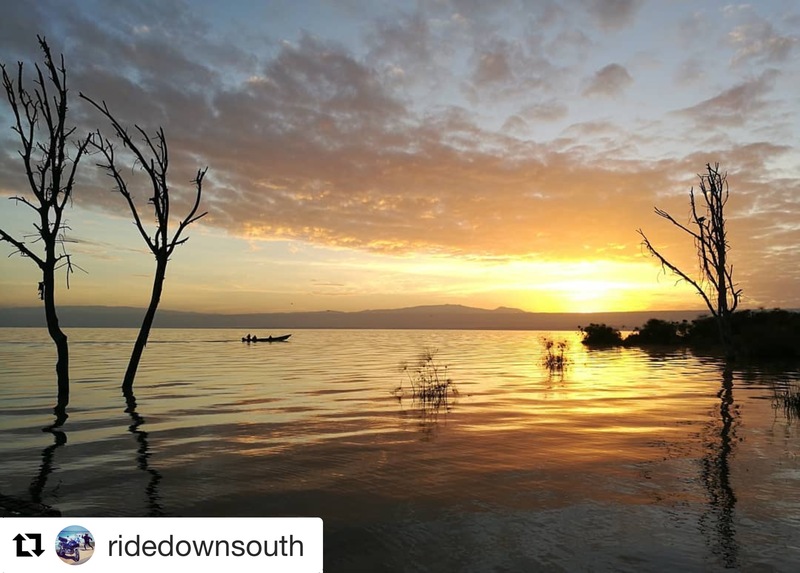 Then, through Southern Kenya into Northern Tanzania, a spectacular journey of empty roads and endless vistas, culminating in a dusk ride under the luminous snow capped peak of Kilimanjaro. It was such a great day that despite a three and a half hour delay at the border and the fact that my bike decided to just quit working at 80KPH on the major highway into Nairobi, nothing could spoil it (the inestimable Andrew fixed my bike quickly and Danielle spoke loving words of encouragement over it to keep it going. They were definitely better words than I used.....). But here’s the thing. As incredible as the roads and views are. I am coming once again to realize that it’s the people that make this world beautiful, that make the journey so worthwhile. People like Jesteohe, our Masai guide in the Mara, who talked to me about his life and customs as we had coffee under a tree, or the Dutch couple Lisa and I met at dinner that night in a tent at the camp, who were traveling together and didn’t just want the adventure, but really wanted to understand about the cultures they were seeing. She was a teacher trainer and we immediately bonded as we talked about how education can change the world. People like Tatiana, who Kaitlyn and I met at the border yesterday, part of a Russian tour group travelling through Kenya and Tanzania, a lovely girl who proved that politics and international tensions are largely due to idiots, and that we could all easily get along if we laughed together and told stories of our lives back home. After all, we’re all just humans. People like Faudi, who we met at dinner last night. It was his 50th birthday and he had just come down from Kilimanjaro, so we bought him a beer to celebrate. Sadly he didn’t make it to the top, but his girlfriend was summiting that evening and he was waiting for her. We talked for ages about his life living in the Middle East and how that part of the world works. As he got up to go, I sent my congratulations to his wife and corrected it to his girlfriend. He stopped and said “Well actually I was planning to give her this at the summit of Kilimanjaro” and pulled out a ring from his pocket. “Guess I’ll give it to her in Zanzibar now. Goodnight”. Best. Exit .Line. Ever. And finally I’ve also realized that the people we think we know are way more beautiful and precious and unique and amazing than we realize, if we just take the time to listen. I have friends on this trip I knew from before. But I’m realizing that I missed so much and in taking the time to learn about the rich tapestry of their stories, I am humbled beyond words to have the privilege of knowing them. I have also made new relationships that I am very happy to have in my life now. Without exception, I am learning new things about my companions and about myself as we engage in laughter and discussion and as we ride through Africa together. It is a thing of incomprehensible beauty. Last night ended with a few of us staying up late and talking about the issues of gender and male power dynamics. Hearing the stories of what successful, intelligent, talented women have to go through just to do their job, filled me with sadness and renewed a desire in me once more to do all I can to be a hinge on a door for them to walk through. We all have a story that is the summation of our upbringing and experiences, good and bad. A journey likes this helps you to reflect on that as you listen and attempt to understand what makes people who they are. And in that, perhaps we can gain an understanding of how we can help make their journey just a little bit easier, how we can make the world just a little bit better, and how we can become better human beings ourselves. If we just learn to listen. I hope I remember this when I get home. Posted in Ride on August 10 by Andy. We’re having a wonderful time in Kenya. Here’s Faith to tell you about yesterday’s life highlights. 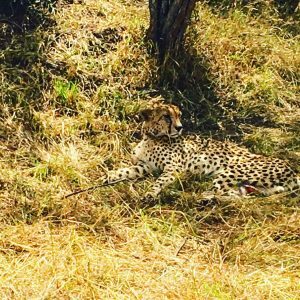 Yesterday’s sleep was brief and broken up in Mara Explorers camp partially due to the excitement of today’s game drive and fear of oversleeping and partially due to unusual howls periodically unleashed which I learned were none other than local hyena. 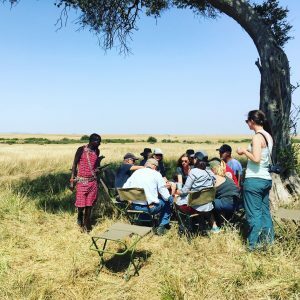 At the crack of dawn we loaded up 2 land cruisers and set out for an incredible 11 hour expedition into the 1500 square km of the Savannah grasslands which is the Masai Mara National Reserve. Our tour guide and driver, Geoffrey, from the local Masai village was quite hospitable and informative with a keen sense of tracking as well as a great sense of humour. 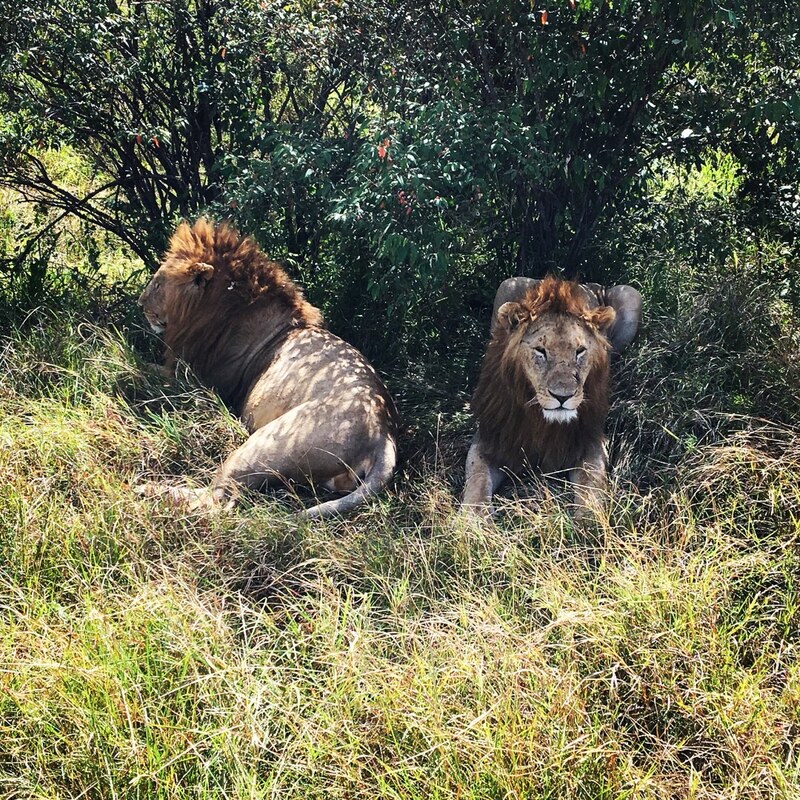 After already getting us up close and personal with elephants, giraffe, zebra and water buffalo, he made a sudden change of course and indicated with some excitement that he wanted to point out the African Dung Beetle. Before we had time to scratch our heads and wonder about this specimen we were abreast a pride of lions! I’m still waiting to see these Dung Beetles as promised .... All in all it was a fantastic game drive encompassing the full circle of life from a male lion jumping on a female in heat, to vultures feasting on the remains of Wildebeeste who couldn’t quite make it cross the river, to the remains of an impala hanging from the branches of a desert date tree, evidence of a leopard’s survival of the fittest. Today, we travelled back to Naivasha and had a great journey, interspersed with an interview with Kenyan media at a stop along the way about our trip and why were raising funds for Wellspring. We’re about to head out on a boat cruise on the Lake and then we’ll enjoy a night off, relaxing as we get ready for the long ride tomorrow to Moshe, Tanzania. Hope you’re enjoying the ride with us! Posted in Ride on August 8 by Andy.